Olbia is a port and airport town in the north-eastern corner of the island of Sardinia. The town has a long history, and although nowadays it is mostly seen as a transit town for travellers arriving in or leaving Sardinia, Olbia has enough charms to merit some attention in its own right. Olbia has one or two important sights within the town, and its small historic core is a pleasant place to amble and to sit at a restaurant or bar. The town isn’t expensive, and it makes a good base for a day or two – perhaps longer, if you are planning to take a boat trip, visit beaches or explore nearby sights. If you are travelling to or from Olbia Airport, it is certainly worth considering spending a few hours in the town itself. 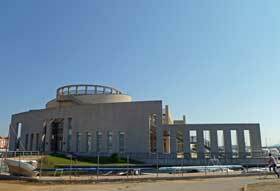 Olbia’s important tourist sights are quickly enumerated: two churches and an archaeological museum. The town lies on the shore of a large bay, with a road separating the town from the harbour. Olbia’s historic port, in use since pre-Roman times, was in this area, but nowadays the main ferry port is on an island in the bay, connected by a causeway to the town. Olbia’s central core is based around Corso Umberto, a lively shop-lined street leading uphill from the waterfront. At the top of a low hill, it opens into Piazza Margherita, a kind of a low-key hub of the city. Around this heart, there are several attractive narrow lanes lined with old stone buildings, and a few yards from Piazza Margherita, another attractive little square, Piazza Matteotti. by the Vandals. Restoration is a slow business, but when we visited two of the ships and a smaller medieval vessel were on display on the museum’s ground floor, the relics including an 8m high Roman mast – a rare survival. Accompanying videos explain ancient ship construction techniques and provide a dramatic, film-trailer-style account of the Vandals’ arrival. If the ships are not visible when you visit the museum, ask at the information desk – we were allowed in on an escorted tour. Other highlights in the museum include a small bronze boat from the Nuraghic era, a head of Hercules which was found in the sea, some fine Roman decorated glassware, an incense burner depicting musicians riding a camel, and a small gold cross. Most visitors to Olbia will be travelling through town en route to or from other Sardinian destinations. This north-eastern part of Sardinia contains some significant tourist destinations, both on and off the beaten track. The Costa Smeralda, a chain of famously expensive modern seaside resorts, is just to the north, while beyond the glamour lie some less pretentious towns and islands, where you can still – outside August – find romantically empty sandy beaches and turquoise waters. Either by car or by bus it is easy to reach the north coast of Sardinia, with resorts like Santa Teresa Gallura and Palau, the ferry departure point for La Maddalena island.